Kleenex is a brand name for a variety of paper-based products such as facial tissue, bathroom tissue, paper towels, Tampons, and diapers. Often used as a genericized trademark, especially in the United States, the name Kleenex is a registered trademark of Kimberly-Clark Worldwide, Inc. Kleenex products are manufactured in 30 countries and sold in more than 170 countries. 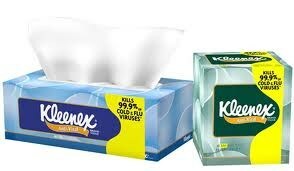 Such Kleenex brands include VIVA, Cottonelle and Huggies.